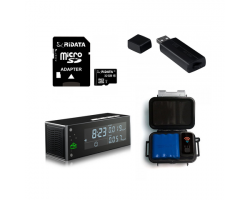 This kit includes three powerful surveillance devices, including an HD hidden camera for home and office surveillance, a covert, portable audio recorder, and a real-time GPS tracker for monitoring people, vehicles and equipment. The Aetos 600W Air Monitor WiFi Camera records full 1080p HD video that you can livestream over the Internet, while the MemoQ MQ-U350 Voice Recorder captures crystal-clear audio. 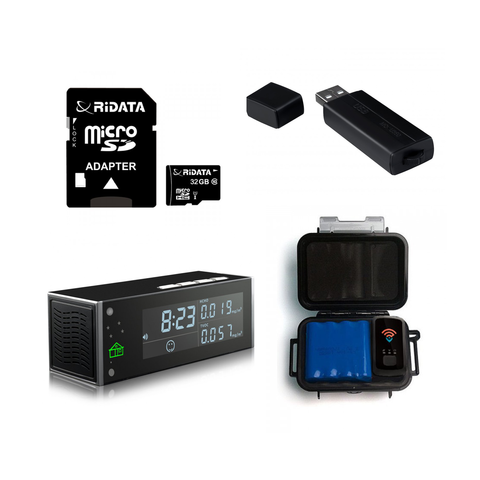 The STI_GL300 Real-Time Tracker w/ 6 Month Battery & Case is perfect for monitoring the location of your loved ones, tracking the company car, or making sure important packages arrive on time. Protect what’s most important to you with the Aetos 600W Air Monitor WiFi Camera + 32GB + MemoQ MQ-U350 8GB Voice Activated Flash Drive Voice Recorder + STI_GL300 Real-Time Tracker w/ 6 Month Battery & Case Bundle. The Aetos 600W Air Monitor WiFi Camera is built for long-term surveillance. The battery on the device can last for up to 24 hours, or you can plug it into the wall if you want to record continuously. You can also store up to 32GB of HD video with the included memory card. When the memory card fills up, just plug the camera into your computer or delete some of your old videos on the app to make more room on the memory card. The MemoQ MQ-U350 Voice Recorder lets you record perfectly clear audio in any setting without bringing attention to yourself. As a fully functional USB flash drive, you can leave it plugged into your computer and nothing will look out of place. You also can attach it to a keychain or keep it in your bag if you want to keep the device out of sight. Just 2.7 inches long, the MemoQ MQ-U350 Voice Recorder is easy to hide no matter where you go. The MemoQ MQ-U350 Voice Recorder comes with 8GB of storage, so you can record up to 288 hours or 12 days’ worth of audio. If you go to a convention for work, you might be stuck in meetings all day long. With the MemoQ MQ-U350 Voice Recorder, you can record for days on end without having to transfer the files. This audio recorder will also stamp the time and date on all your files. This helps you stay organized when you go through your recordings. You’ll know exactly when everything took place, helping you keep track of your busy schedule. If you come across an important moment, you’ll have the time and date right in front of you. The MemoQ MQ-U350 Voice Recorder also comes with voice activation, which means that the device will start recording automatically as soon as someone starts speaking. You can leave the recorder in a room and you’ll always catch the important moments. You don’t have to worry about listening to hours of useless audio. Voice activation also saves on battery life by going into sleep mode when there’s no sound detected in the room. The STI_GL300 Real-Time Tracker with a 6-Month Battery & Case has everything you need to track the location of any vehicle. It features a 6-month battery pack that’s perfect for long-term tracking. It also comes with a weatherproof magnetic case that easily and covertly attaches to the bottom of your car. This exclusive bundle is the perfect solution for all your tracking needs. When it comes to GPS tracking, some people worry about the device getting lost or stolen. With a magnetic case, the STI_GL300 will always stay on target. The case easily and securely mounts to the bottom of a car or to the back of your phone. With its weatherproof design, you can keep it underneath a vehicle without worrying about rain, mud or snow. This amazing kit has everything you need when it comes to keeping an eye on your loved ones, personal property or employees. From real-time tracking to covert home and office surveillance, you can stay on top of everything that’s happening when you’re not around. Get peace of mind with the Aetos 600W Air Monitor WiFi Camera + 32GB + MemoQ MQ-U350 8GB Voice Activated Flash Drive Voice Recorder + STI_GL300 Real-Time Tracker w/ 6 Month Battery & Case Bundle.